Today I'm sharing with you the fantastic array of goodies my lovely friend Hayley brought me back from New York recently. 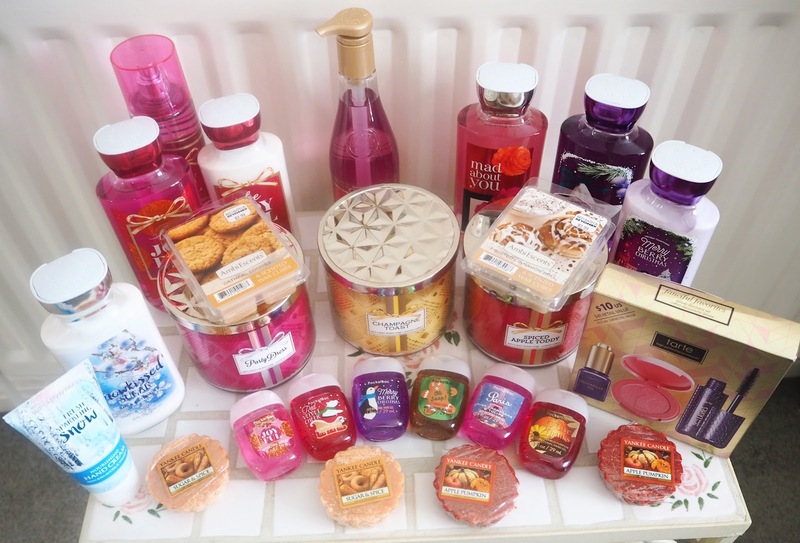 It includes items from Bath & Bodyworks, Yankee Candle, Tarte Cosmetics and Ambi Escents. It's very exciting to get things you can't usually pick up over here! I'm a big fan of Bath & Body Works products but unfortunately they aren't readily available in the UK, despite a big demand. So we either have to pay really high costs for them on eBay or ask friends to bring products back when they're over in the US. I have found that you can get a few bits on Yankee Scents 4U if you fancy taking a look. Party Dress: "A stylish blend of orchid petals, billowing white peony and soft jasmine that's absolutely perfect for every holiday season party." 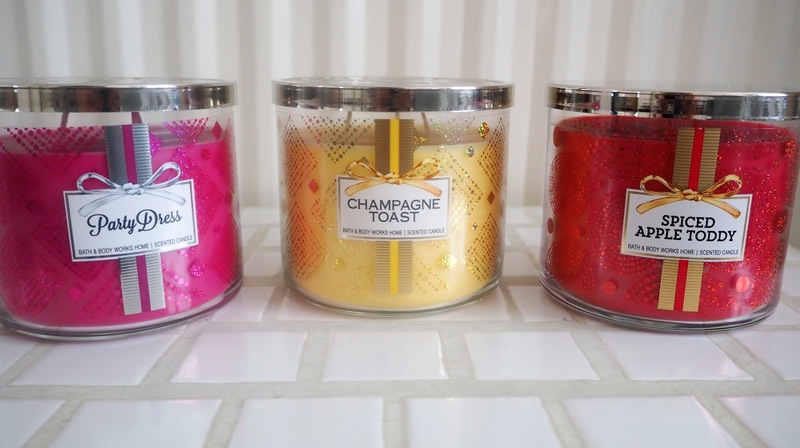 Champagne Toast: "Pop, clink & sparkle with an effervescent blend of champagne, juicy nectarine and blackcurrant." Spiced Apple Toddy: "A sweet mixture of winter fruits, apple brandy & spiced plum to warm your holiday celebrations." This is the one I've burnt most so far, mostly over Christmas, and I'm really loving it! It reminds me a bit of Yankee Candle's Red Apple Wreath but with a stronger apple scent. Be Joyful: "Sparkling clementine, golden mango, frosted jasmine, winter melon and shimmering sugar." Merry Berry Christmas: "Frosted raspberries, holly berries, pink prosecco, jasmine wreath, crystal musk." Snowkissed Sugar: "Spun sugar, chilled coconut, vanilla orchid, snowkissed plum and winter musk." This is my favourite fragrance out of all the lotions/shower gels I think, it's wintery and sweet with vanilla and coconut without being sickly. Mad About You: "This passionate scent is a thrilling blend of blackcurrant, bright peony and pink jasmine kisses with white patchouli and vanilla musk." Fresh Sparkling Snow: "The magic of a winter wonderland? captured in sparkling sugarberries, holiday pear & icy melon"
PocketBac: Be Joyful, Red Velvet Cheer, Merry Berry Christmas, Oh Snap, Paris, Give Thanks. These antibacterial hand gels smell so incredible especially compared to other ones that I've used, no alcohol scent at all. They are ideal to carry in my handbag as they're a perfect little size, I've got one in all of mine now! Yankee Candle: Both of these Yankee Candle fragrances aren't available in the UK so I'm looking forward to sampling them. 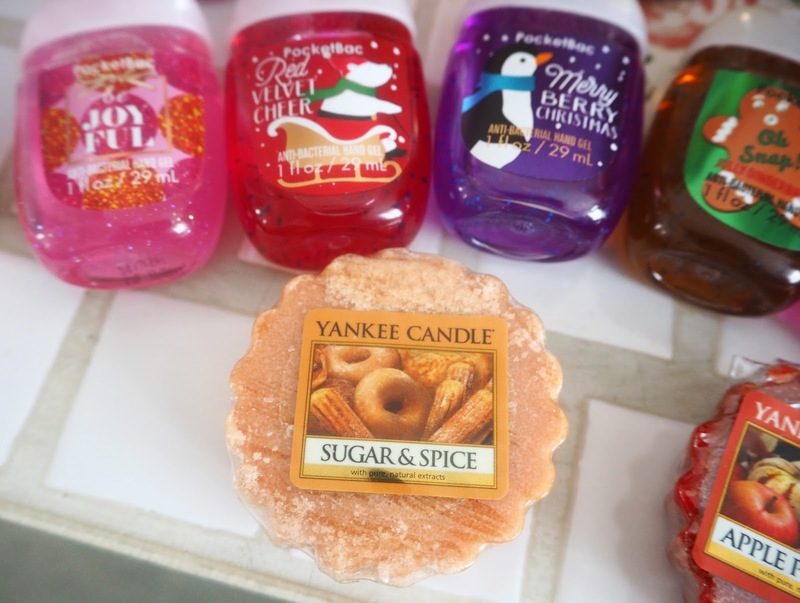 Sugar & Spice: "A mouthwatering swirl of cinnamon, buttery vanilla, and sugar crystals all baking together—guaranteed to fill your home with smiles." Apple Pumpkin: "Homegrown apples and pumpkins, two of fall's classic aromas, come together for a warm, cozy, inviting fragrance that fills the home with the delicious warmth. The slightly sweet, earthy notes from the pumpkin and clove, with a little bit of spiced apple added, bring the season home and offer a arms-open-welcome to family and friends." Tarte Cosmetics Set: I really like Tarte makeup the quality is fantastic and most products are made with their signature Amazonian clay. The only place you can find this brand in the UK is on QVC so we're slightly limited to choice. 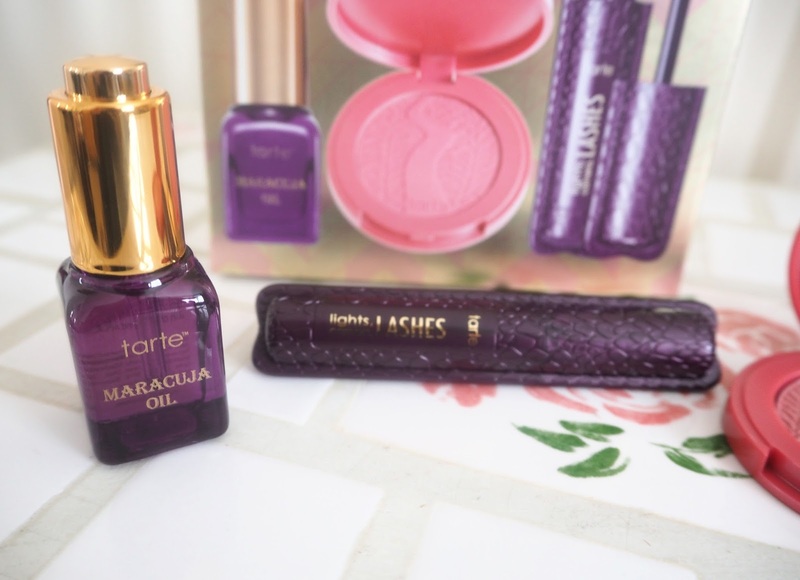 This set includes Tarte's famous Lights, Camera, Lashes Mascara, a mini of the Marajuca Oil (to use under moisturiser) and a blush in the shade Fanciful. Ambi Escents - Bed Bath & Beyond: These are a US brand of special fragranced wax cubes that you break off and melt in a warmer. They smell amazing! Oatmeal Cookies: "Baked brown sugar, vanilla, chopped nuts, and a hint of spice." Frosted Cinnamon Roll: "Smell the creamy glaze melt off a hot bun as curls of cinnamon and brown sugar beckon you with their fragrance." What are your favourite fragrances from Bath & Bodyworks? Go on make me jealous! Wow there are so many different products here...envy all the Yankee candles, adore candles especially as its so cold here in the UK! So this makes me want to go to the US even more now. You got so many things - Love it! Omg you brought so much amazing stuff back with you!! Love Yankee candles!